This week has been fascinating observing the giant sunspot region 2192 making its way across the solar disc. I was working today to demonstrate the details of the intricate swirls of magnetic activity around the sunspot and filament regions. I utilized the Tilting Sun graphic again for this observation though it is reversed from a standard view to demonstrate my view through the eyepiece. 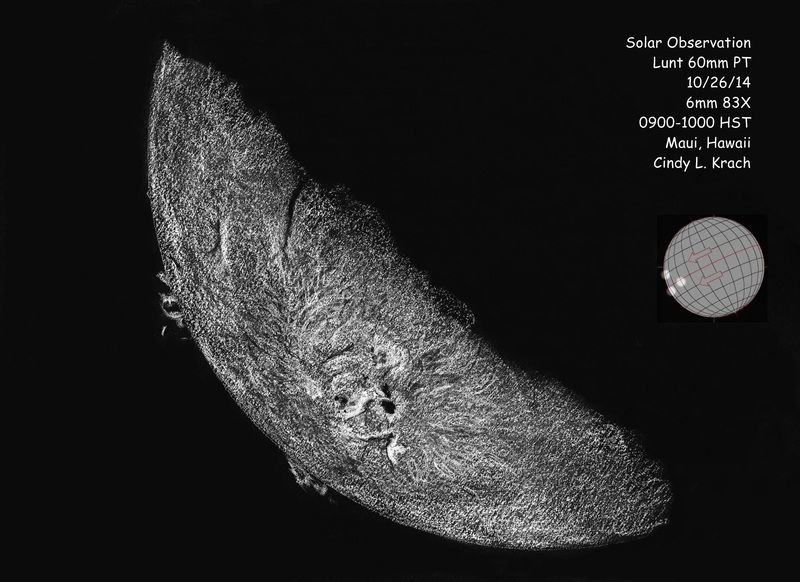 Aloha Cindy, your sun area is superb, very close to what I saw in my Lunt. That was a very nice phenomenon to follow. This is a beautiful capture of the big sunspot group showing the twisted magnetic field lines. Wonderful sketch of that amazing sunspot complex. I viewed it with a white light filter and it was impressive. Your sketch is a added treat to the eyes of those of us who don’t have a H-alpha. Thanks! Thank you Michel, Frank & John!